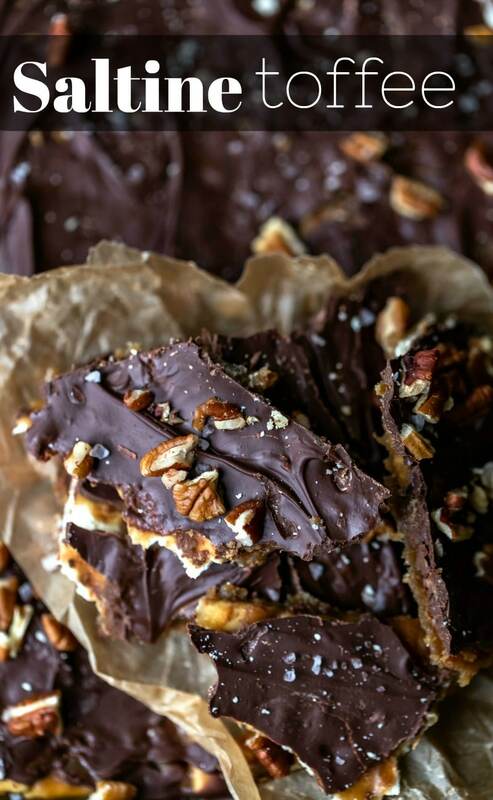 Saltine Toffee (Christmas Crack) is an easy candy recipe that’s made with Saltine crackers, homemade toffee, and chocolate topping. I love baking with my kids this time of year. We make sugar cookies, molasses cookies, and all of the other traditional recipes. We also love to watch Christmas movies and make special treats to enjoy while we watch the movies. 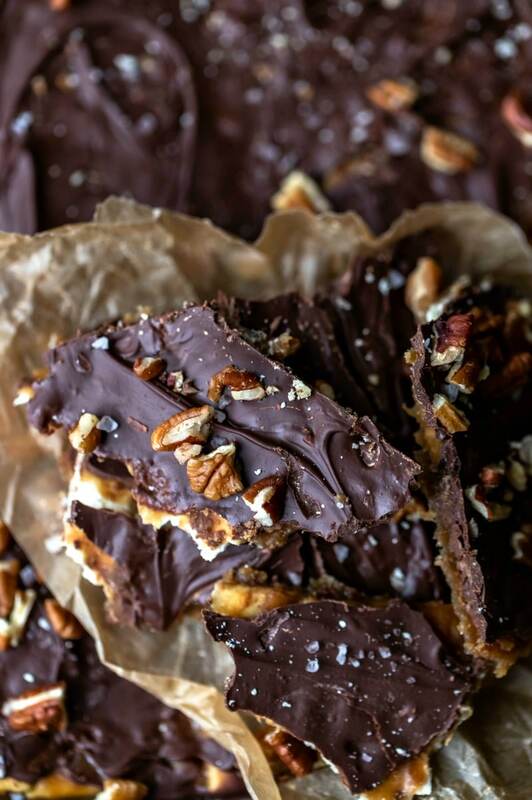 This Saltine Toffee is an easy treat that my kids go crazy for. It’s sometimes called “Christmas Crack” or “Club Cracker Toffee”. No matter what you call it, it’s delicious! The combination of the salted crackers, sweet, buttery toffee, and chocolate makes it irresistable. Saltine toffee is also called “Christmas Crack” or “Club Cracker Toffee”. It’s made by pouring homemade brown sugar toffee over a layer of Saltine crackers, and it’s a traditional holiday treat that is enjoyed or gifted around Christmas. Begin by lining your pan with parchment paper or a silicone baking mat. Next, place a single layer of crackers in the pan. I use a rimmed 10×15-inch pan, which is a jelly roll pan. I use regular, salted Saltine crackers. You need the salt in the recipe to help balance out the sweet toffee. Then, prepare the toffee by bringing the butter and brown sugar to a boil in a saucepan. I use salted butter and dark brown sugar. The dark brown sugar gives it a richer, stronger toffee flavor than light brown sugar would. Cook for 2-3 minutes, stirring regularly. Then, remove from heat and stir in the vanilla. Pour the hot toffee over the crackers and spread it to cover the crackers. After you bake the toffee, sprinkle the chocolate chips over the hot saltine toffee, and let them sit for 5 minutes to soften. I use either semisweet or bittersweet chocolate chips. Since the toffee is so sweet, I like a less sweet chocolate – like bittersweet. However, if you like super sweet toffee, you can use milk chocolate chips. Then, once the chocolate chips have softened, spread them to cover the toffee. At this point, sprinkle with chopped pecans and large grain sea salt if using. Let the toffee sit for an hour at room temperature, and then cool in the fridge or freezer for 20-30 minutes. Finally, cut or break into pieces. 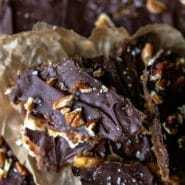 If you’ve tried this saltine toffee recipe, don’t forget to rate the recipe and leave me a comment below. I love to hear from people who’ve made my recipes! You can SUBSCRIBE to receive my latest recipe newsletters or FOLLOW ME on FACEBOOK, INSTAGRAM and PINTEREST for even more delicious food. 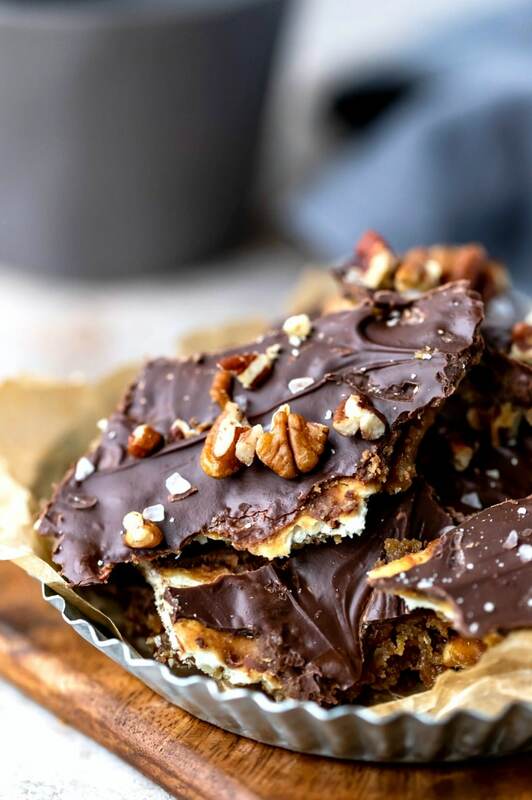 Easy saltine toffee recipe. Check out the step-by-step photos and tips above the recipe. Preheat oven to 400 F. Line a 10x15-inch rimmed baking pan (jelly roll) with parchment or a silicone baking mat. Lay the crackers in an even layer across the bottom of the baking pan. In a medium saucepan over medium heat, bring butter and brown sugar to a boil. Let boil, whisking regularly, for 2-3 minutes. 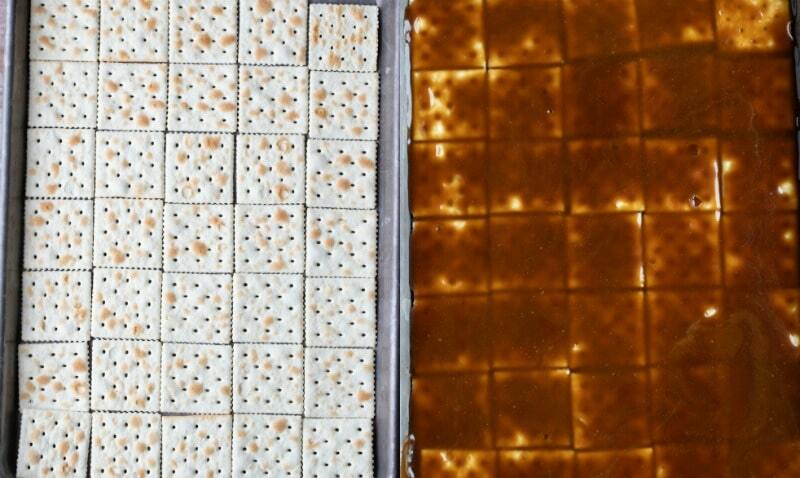 Carefully pour toffee over crackers, and spread toffee over crackers. Remove from oven, and sprinkle chocolate chips over crackers. 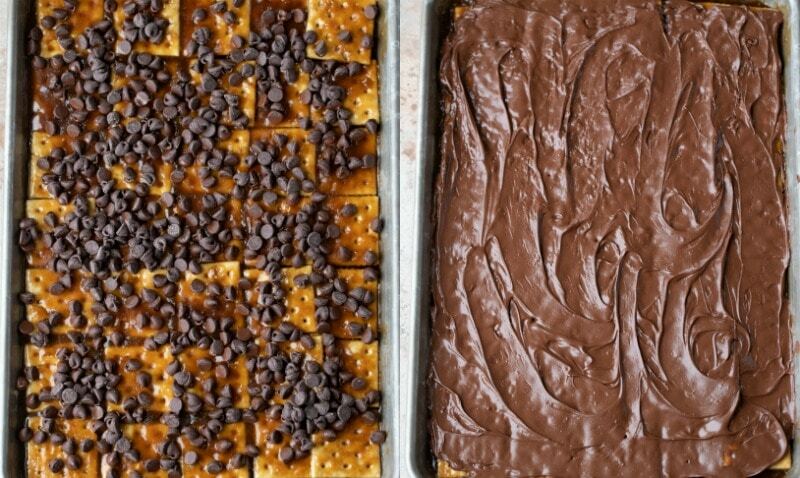 Gently spread chocolate over crackers. Sprinkle with chopped pecans and sea salt, if using. Let sit at room temperature for 1 hour. Chill or freeze for 20 minutes. I recommend using regular, salted Saltine crackers. I don't pack the sugar. However, if you like the toffee sweeter, you can. Also, I use dark brown sugar for a richer toffee flavor. You can use light brown sugar, but it won't have as much toffee flavor. I use bittersweet chocolate chips to keep the toffee from being too sweet. However, you can use anything from milk to semisweet to bittersweet in this recipe. This is a very good recipe. I used semi-sweet chocolate chips and topped the candy with walnuts. Thanks! I’m glad that you liked it. =) Thanks for commenting!